Quake is a video game by id Software released on June 22, 1996, which features music composed by Trent Reznor. Most versions of the game included 10 audio tracks from the game as standard CD-Audio files, so the game disc could be played in a CD player with the first track reserved for game data (which cannot be read by a CD player), and 10 additional tracks of music. Some versions of the game include shortened edits of the music tracks. Other members of Nine Inch Nails also helped to create the music. Reznor was also responsible for the game's sound effects. It is notable that this soundtrack contains ambient music, which Reznor went on to explore further on Ghosts I-IV and various scores created with Atticus Ross. There are in fact no official names for these tracks, as they remain untitled in the accompanying game literature. They can be referred to by their track number; however, because the first audio track is the CD's second track (the first being reserved for the actual game data), this usually leads to confusion. As such, they can also be referred to in the format of Ghosts I-IV track titles (e.g. "02 Quake I"), numbers (e.g. 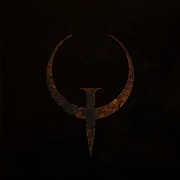 "Quake 1"), sequenced untitled tracks, and so on. "Persia Inversion", "Quake Theme" or "Main Theme"
"Aftermath", "The Life Beneath It All" or "Intermission"
"The Hall of Souls", "Conscience" or "Start/Whispers"
"It is Raped", "Freezing Vertigo" or "Grisly Grotto"
"Parallel Dimensions", "The Journey" or "Slipgate Complex"
"Life", "The Hammer" or "Underearth"
"Damnation", "Ice" or "Castle of the Damned"
"Falling", "Violence Inside" or "Ziggurat Vertigo"
"The Reaction", "Death" or "Gloom Keep"
A particular weapon in game play is the "nailgun" which can be reloaded by collecting ammo boxes decorated with the NIN logo. Also, Reznor was the original choice for sound design on id Software's Doom 3, but circumstances halted his involvement. Former NIN member Chris Vrenna composed the game's theme song. Titles of songs or themes (C) 1996 TVT/Interscope Records. Special thanks to Trent Reznor and Nine Inch Nails for sound effects and music. This page was last modified on 8 December 2018, at 23:06. This page has been accessed 244,010 times.